Los Angeles magazine staff and contributors share what’s on their table this season. Los Angeles magazine takes food seriously—heck, we dedicate four whole issues to eats each year. So, it’s no stretch to say we love Thanksgiving. Here’s what our editors and contributors are excited to dig into today. As we ready to gather round tables full of food, this is our thanks to you, the reader, for always coming back to our table for another helping, month after month and year after year. Mary Melton, Editor in Chief: Two must haves: Pecan pie from Pie n Burger—it’s always my husband’s job to brave the crowds at the Pasadena institution to pick them up; and classic green bean casserole made by one of us Melton kids, just like our mom’s version (the one time a year we utilize cream of mushroom soup and canned fried onions). Matt Segal, Executive Editor: We always have mashed sweet potatoes with walnut glaze and roasted baby potatoes with sage and pancetta. And if smoking the bird works out, that’ll be a tradition, too. Nancy Miller, Deputy Editor: I grew up in a large family with a Canadian mother, which means there were a lot of mouths to feed and not a lot of traditional recipes handed down, since they don’t celebrate Thanksgiving in Canada. I say this because it helps justify my claim that it isn’t Thanksgiving for me without a heap of Stove Top Stuffing. Over the years, I’ve done the orphan thing and spent T-day with friends who put painstaking effort to prepare REAL stuffing, That is, a dish derived from actual bread, that you have to mix with things like sage and chestnuts, and then put in the oven, to bake. But as much as I try, I crave the flavor of the dehydrated bread nuggets you get in a box of Stove Top, with flavor spores that magically come to life when you add water and some butter—in five minutes—no oven needed. Over the years, my mom has jazzed things up with the Stove Top and there’s even a sage flavor on the shelves these days. But well, T-giving is about comfort and good memories, and nothing says that like the chicken one, with some turkey and mashed potatoes—at least those are real. Lesley Bargar Suter, Dine Editor: Fennel sausage cornbread stuffing! Found it three years ago and now the entire family demands it. Secret ingredient? Pernod. A little booze helps everything. Caroline on Crack, Contributor: A persimmon crumble! My parents have two persimmon trees in their backyard and every year get a mother load of persimmons, more than anyone knows what to do with. The only thing I really figured out what to do with them, since I’m not much of a baker, is the persimmon crumble. It’s stupid easy to make and now every Thanksgiving it’s what I bring to the table. It’s a nice addition to any dessert table full of pies and bread pudding. Tracy Seng, Associate Publisher: My Dad’s mashed potatoes…ridiculously buttery, smooth and delicious. He’s a heavy pepper fan, but maybe that’s what ultimately makes them taste so good. I won’t be “home” on the east coast with my family this year, so I’m going to attempt to make them at my place and share the buttery, creamy goodness with my “LA family”. Oh and the super-duper chocolaty flourless brownies that I make from only 6 ingredients. They’re sick. I’m making them here in LA so sorry east coast family…none for you! 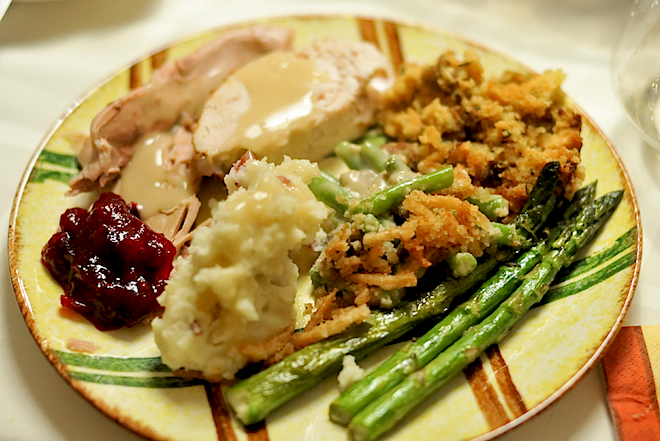 Marissa Mimoun, National Account Director: My moms stuffing! Leilah Bernstein, Associate Editor: A few years ago my sister and I started cutting sweet potatoes into cubes and tossing them with olive oil, salt, pepper, and fresh rosemary. We lay them out on a baking sheet, put in the oven till crispy on the outside, gooey-soft on the inside, and that’s it. The simplest, sweetest dish! Chris Nichols, Associate Editor: A relative who has since passed on was famous for her goopy delicious green bean casserole. The recipe was quite complicated, and involved… let me think about this. Oh yes, a can of green beans, a can of mushroom soup, and a can of french fried onions. I think we need a few more years to properly miss this dish before bringing it back. Sonia Wilson, Fashion, Beauty, Entertainment Manager: Pretty typical but Green Bean Casserole. We have had it at every Thanksgiving I can remember. I am not much of a cook but it is now my responsibility and luckily easy to make. I always say I am going to make it at home but its something to look forward to so I stick to Thanksgiving. Linda Immediato, Senior Editor: Pumpkin Cheesecake with Bourbon Sour Cream Topping, Gourmet 1990. I’ve been making this cheesecake since 1997. I discovered it while working at my first print magazine job — at the now defunct (so sad!) Gourmet magazine. I don’t like pumpkin pie but I wanted to make something seasonal and holiday appropriate and we always received tons of reader requests for this recipe (this was before Epicurious and Google!) so I figured I’d give it a shot. It was an instant hit with my family, largely usurping my homemade apple pie as the most popular sweet on the table (however, I still have to make the apple pie too, cause my Nanna is 102 and still loves her some apple pie!). My brother however, won’t let me in his house without the cheesecake. When I knock, he’ll yell through the door, “Let me see the cheesecake!” In fact, I know when Thanksgiving is approaching because WEEKS before I’ll get texts from him making sure I plan on making one. This year, the first text came in on October 24th, “Are you coming in for Thanksgiving? I want a pumpkin cheesecake.” Depending on the year, his birthday will fall on Thanksgiving, as it does this year, and on those years I make him his very own pumpkin cheesecake. Summer Austin, intern: I’ve been a vegetarian all of my life (recently pescetarian), so we have to get creative for Thanksgiving. Normally we have wild rice, cranberry sauce and cheese souffle (mostly for me). Since there are only three of us, my parents then normally have cornish hens instead of a large turkey (too much for two people). I won’t be home this year, so we will probably make this dishes when I visit for Christmas. We live on the Gulf Coast so my father also makes crawfish etouffee sometimes for either Thanksgiving or Christmas. He learned to make it when he lived in New Orleans. Brittney Brombach, Account Manager: Our Thanksgiving tradition is egg noodles, which started 60+ years ago with my great grandmother as it was part of her German-Dutch heritage. The recipe has been passed down to my great uncle and my father, who always spend the Sunday before making the noodles from scratch for our large family (15-25 peeps) gathering. It’s really just egg yolk, flour and water and we can easily use 8 dozen eggs for one batch (we have some big eaters in the group, plus we love leftovers!). It’s a coveted recipe, delicate process and gives the turkey a run for its money as the focal point on the dinner table. We tenderly boil the noodles in a secret stock which adds to the complex and butter taste of the noodles. Only served once a year, it’s worth running a few extra miles throughout the year so I don’t have to avoid the heavy yet delicious tradition! Julia St. Pierre, Production Director: Pecan Pie. It was my father’s favorite. It was always on the table growing up, but if my mother made it early in the day or the day before, she had to hide it. Shayna Rose Arnold, Senior Editor: It’s not a crowd-pleasing sentiment, but I hate the taste of turkey. Always have, always will. Other things I don’t happen to like: sweet potatoes and stuffing, Which makes Thanksgiving awkward. (For what it’s worth, I’ll happily eat good old mashed potatoes or green bean casserole any day of the week.) To keep me from going hungry or filling up on just salad, creamed veggies, and dessert, years ago my dad started a tradition of sneaking me some sushi before the main event. In addition to holding me over, it’s been a wonderful thing for us to share, just us. Since I’ve been married I’ve celebrated Thanksgiving at my in-laws, out of state. Sadly, the day doesn’t involve any secret sushi eating, but I think of my dad, knowing he’s thinking of me, too, and that makes me feel grateful. Brigette Scobas, intern: French’s Green Bean Casserole is a must-have Thanksgiving dish in my family. Ever since I could remember my mom made this side. Vegetables may be a turn-off for most children but once I was served this tasty casserole, I made sure my mom had the ingredients days in advance to guarantee it would not be left off of the table. It includes Campbell’s Cream of Mushroom Soup, milk, pepper, French’s French Fried Onions and green beans. I could not wait for Thanksgiving in a couple of days, so I made it for my friends this past Sunday. Elina Shatkin, Senior Editor: My mom does the cooking. I help her nothing unusual. I’m actually not a big fan of Thanksgiving, the holiday or the food (I don’t care for stuffing or yams, and the things people do to green beans never ceases to baffle me). I prefer the leftovers. Here’s what I ALWAYS eat in the days after main event, which are infinitely tastier than the Thanksgiving meal itself. Curried turkey pot pie: This is the best use of leftover turkey ever! I make my own crust from scratch (not hard to do) and use any veggies that are laying around. I also use a lot more cumin than most people and plenty of full-fat coconut milk. Apple latkes: my mother makes these and they are the best things in the entire world. No friend of mine who has ever tried them has failed to be wowed by them. You take tart green apples (Granny Smith are good), peel them (my mom is a whiz at this; I am terrible), shred them but not too finely, mix them with egg, a pinch of salt, a bit of sugar, and the barest amount of flour so they hold together. Flatten them into thin patties and fry them lightly in oil until they’re golden brown. Serve with full fat sour cream. Daniela Galarza, Deputy Digest Editor: Brown sugar pie. I found the recipe online somewhere six years ago and now I have to make it every year. My brother sometimes asks me to make two so he can eat an entire pie himself the morning after Thanksgiving.